"Today, we put the strongest sanctions on Korea that we have ever put on a country," President Donald Trump said during a meeting with Australian Prime Minister Malcolm Turnbull. "We must continue to stand together to prevent the brutal dictatorship from threatening the world with nuclear devastation." The latest curbs increase the number of sanctions imposed on North Korea to over 450 sanctions since 2005, half of them put in place in the past year. The new sanctions are part of the Trump administration policy of applying intense pressure on Pyongyang to curb its growing nuclear weapons and long-range missile programs. Despite international sanctions, North Korea, primarily with the help of China, has continued to build nuclear arms and missiles that can deliver them to intercontinental ranges. North Korea is believed to have some 20 nuclear warheads and missiles with an array of ranges. Unofficial estimates of its most potent missile, the Hwasong-15, indicate the missile range could be 8,100 miles, enough to hit any target in the United States. North Korea is said to be close to developing a nuclear warhead capable of withstanding the rigors of reentering the atmosphere at high speed. Treasury Secretary Steve Mnuchin said the latest sanctions "will significantly hinder North Korea's ability to conduct evasive maritime activities that facilitate illicit coal and fuel transports, and limit the regime's ability to ship goods through international waters." Mnuchin said intelligence reports and public information suggests sanctions on North Korea "are beginning to have a significant impact on their ability to fund their programs." Mnuchin said President Trump's daughter Ivanka Trump, who is visiting South Korea for the closing of the Winter Olympics, informed South Korean President Moon Jae-in about the new sanctions. Asked about China's role in facilitating the North Korean arms trade, Mnuchin said: "I'm not going to make any specifics against Chinese entities. We will continue to look at them like everyone else. We expect people to follow through on the obligations of the U.N. sanctions and our sanctions programs." China and Russia have both been linked to illicit North Korean trading and the administration is working with both governments to curtail the transfers, he said. A classified internal Chinese government document produced in September reveals covert plans by Beijing to support North Korea with increased aid and military goods despite new U.N. sanctions. The Communist Party of China document states that China will promise the North Koreans to circumvent banking sanctions by stating they would "only apply to state-owned banks controlled by the central government and some regional banks." 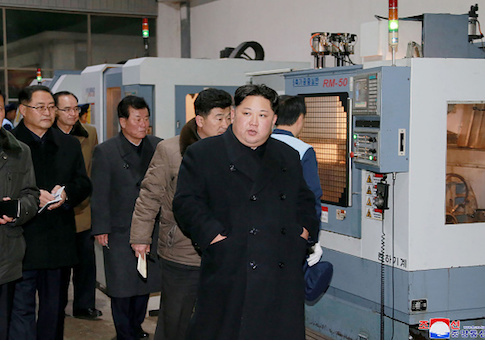 The North Koreans would still conduct illicit trade by using third country banks. Mnuchin said the sanctions hit "virtually all the ships they're using at this moment in time." "We will obviously continue to monitor and use all of our resources to monitor activities going forward, and we will do new sanctions as needed going forward," he told reporters. "We're using all of our sanctions capabilities, and we will continue to do so, to economically cut off illicit activities." The Treasury action targets one person, 27 companies and 28 located or linked to North Korea, China, Singapore, Taiwan, Hong Kong, Marshall Islands, Tanzania, Panama, and Comoros. The sanctions block any property or assets of the entities named. That means any banks doing business with the companies could be barred from using the U.S. financial system, a penalty that can make it very difficult for foreign banks to do business in the international marketplace. The administration called the new sanctions the largest set of sanctions imposed on the rogue state that has been the target of multiple United Nations sanctions over the past several decades in a bid to curb its nuclear weapons and missile programs. Mnuchin said Treasury has a large group of people dedicated to curbing illicit North Korea activities, and said more sanctions could be imposed in the future. The secretary also said he would not rule out that North Korean ships could be boarded and inspected for illicit trade in the future. "The president has made it clear to companies worldwide that if they choose to help fund North Korea’s nuclear ambitions, they will not do business with the United States," Mnuchin said. On the shipping advisory, the global alert warns any people or companies doing business with the sanctioned entities face "significant risks" to anyone that enables shipments of goods to and from North Korea. The advisory also provided details on the methods used by the North Koreans in deceptive shipping practices. The sanctions are aimed at curbing covert North Korean shipping designed to evade sanctions, such as transferring coal and other goods in ship-to-ship exchanges in international waters. That practice is prohibited under the latest U.N. sanctions imposed in September following North Korea's most recent underground nuclear tests. 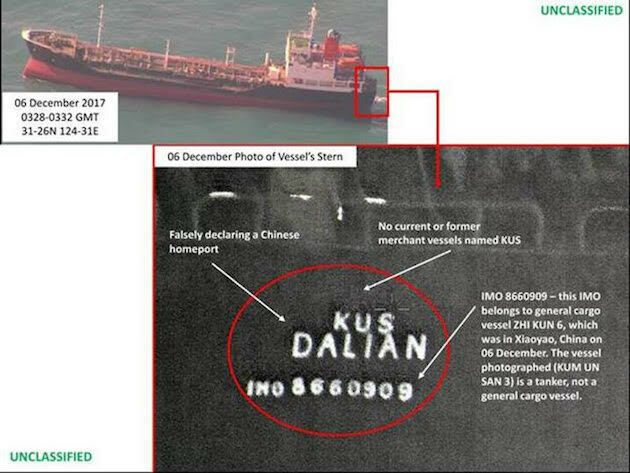 Treasury released photos from December showing the North Korean vessel Kum Un San falsifying vessel information to avoid sanctions-busting activities by painting over the vessel's names and turning off a satellite automated identification system transponders. 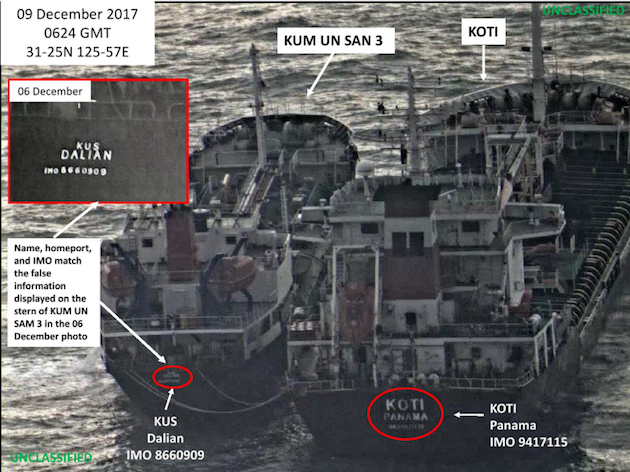 A second photo from December reveals a North Korean vessel attempting to conduct a ship-to-ship transfer of oil with a Panama-flagged tanker Koti. The Treasury sanctions targeted nine international shipping companies and nine vessels engaged in evasive shipping activities. "The regime has been known to use coal export revenues to fund its weapons of mass destruction and missile programs," Treasury said in announcing the sanctions. "These vessels are capable of carrying over $5.5 million worth of coal at a time"
Two Chinese and five Hong Kong shipping companies were among the sanctioned shipping firms. Treasury's Office of Foreign Assets Control also sanctioned Taiwanese national Tsang Yung Yuan for his role in coordinating North Korean coal exports with a North Korean broker in Russia. The Taiwanese Pro-Gain Group Corp. and Kingly Won International Co., Ltd., were sanctioned for illicit oil deals with North Korea. The sanctions also targeted 16 North Korean shipping companies and 19 of the companies' vessels. Intelligence reports in November revealed the companies were engaged in ship-to-ship transfers of fuel oil, chemical in violation of U.N. sanctions. "We are determined through these efforts to increase the pressure on the North Korean regime and show Kim Jong-un that there's no other path for him to take but denuclearization," said an administration official that briefed reporters.